Today we shared the results of the broadest and most in-depth research into global public Wi-Fi hotspots. Analysis conducted by Maravedis Rethink, shows there will be 47.7 million public Wi-Fi hotspots deployed worldwide by the end of 2014. 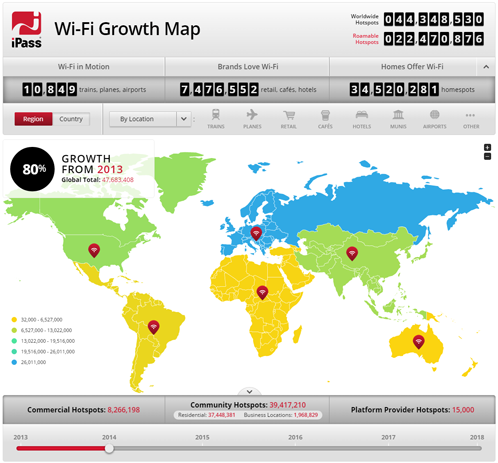 This information is brought to life in an Interactive Wi-Fi Growth Map that lets you see where and when hotspots will be added to various regions and countries in the next four years. The research reveals Wi-Fi is expanding rapidly. Over the next four years, global hotspot numbers will grow to over 340 million – that is nearly one Wi-Fi hotspot for every twenty people on earth by 2018. 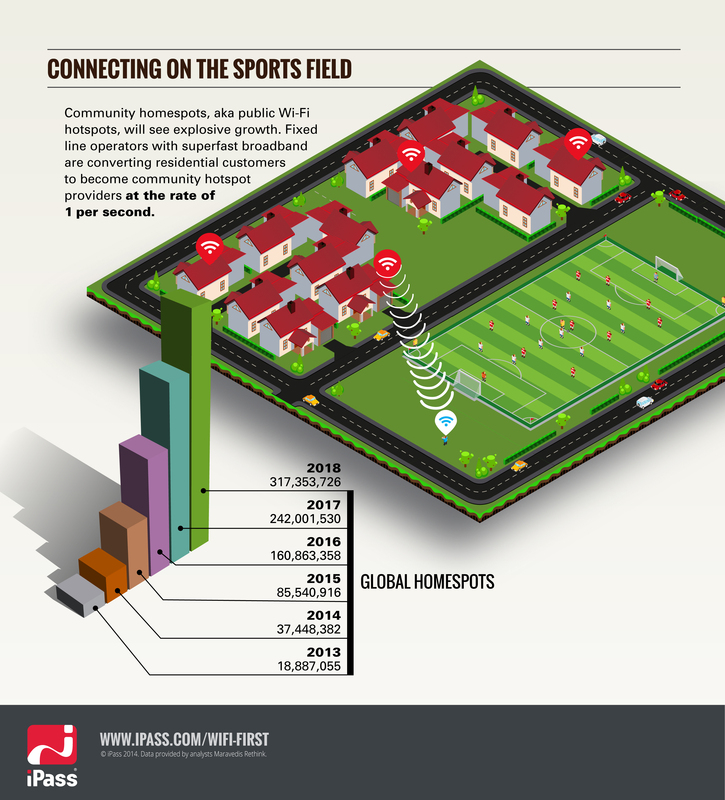 This compares to one Wi-Fi hotspot for every 150 people today. We’ve put the highlights together in this infographic. For business travelers, this is good news. Connecting to Wi-Fi has become essential for getting work done—from meetings, to online collaboration, to sharing files. Wi-Fi dependent devices like PCs and tablets make access to Wi-Fi essential. It’s exacerbated by the demand for high-bandwidth, cloud-based services. In research conducted earlier this year, we found business travelers are clear about what they want: Wi-Fi. Today, finding and accessing Wi-Fi when they travel is one of their top challenges. What this means for brands. For brands, this opportunity is just beginning. Our research showed Wi-Fi is changing the power structures of the telecommunications industry. 50% of all commercial hotspots are controlled by brands. The new Wi-Fi is organic, emergent and empowering and it’s a way for brands to create value for customers. Wi-Fi is hyper-local and by providing hotspot service, brands can understand the behaviors of their customers which allows them to create offers and value that’s perfectly targeted to their needs. 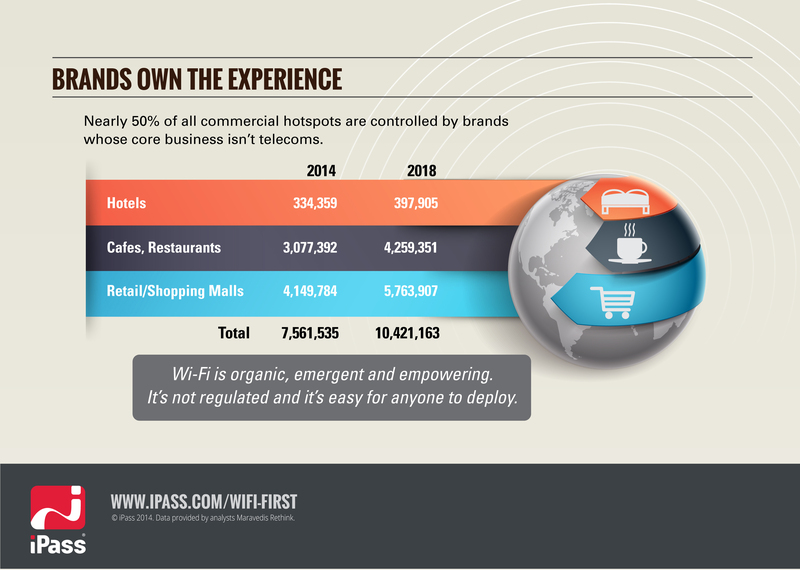 Brands can use Wi-Fi to keep customers staying and coming back to their stores, coffee shops and restaurants. And brands can use Wi-Fi to create loyalty. For example Zegna, an Italian men’s suit designer and retailer offers iPass to its top customers in its OneWorld customer loyalty program. Wi-Fi continues to be easier to find for the consumer. More hotspots mean more access. Homespots will provide Wi-Fi in places that haven’t had coverage before – like while watching a kid’s soccer game at a school. More hotspots will mean brands will offer new, targeted and relevant offers. Imagine getting a two for one lunch offer when logging on to Wi-Fi at your local sandwich shop or access to a large group of hotspots through your Facebook or Google user name and password. And as Wi-Fi becomes available, more devices will be able to connect and do more for you. Just think, it won’t be too long until all of our cars are Wi-Fi enabled. Today iPass lets people connect to over 12 million hotspots with a single user name and password. This means easy, convenient access to Wi-Fi around the globe, on the ground, in planes, trains with cars on the way. We invite you to learn more about iPass for you and your business.